The dsp.DigitalDownConverter object translates digital signal from intermediate frequency (IF) band to baseband and decimates it. Create the dsp.DigitalDownConverter object and set its properties. dwnConv = dsp.DigitalDownConverter returns a digital downconverter (DDC) System object™, dwnConv. dwnConv = dsp.DigitalDownConverter(Name,Value) returns a DDC object, dwnConv, with the specified property Name set to the specified Value. You can specify additional name-value pair arguments in any order as (Name1,Value1,...,NameN,ValueN). Set this property to a positive scalar value, greater than or equal to twice the value of the CenterFrequency property. Set this property to a positive integer scalar, or to a 1-by-2 or 1-by-3 vector of positive integers. When you set this property to a scalar, the object automatically chooses the decimation factors for each of the three filtering stages. When you set this property to a 1-by-2 vector, the object bypasses the third filter stage and sets the decimation factor of the first and second filtering stages to the values in the first and second vector elements respectively. Both elements of the DecimationFactor vector must be greater than one. When you set this property to a 1-by-3 vector, the i th element of the vector specifies the decimation factor for the ith filtering stage. The first and second elements of the DecimationFactor vector must be greater than one, and the third element must be 1 or 2. When you set this property to false, the object designs filters with orders that you specify in the NumCICSections, SecondFilterOrder, and ThirdFilterOrder properties. 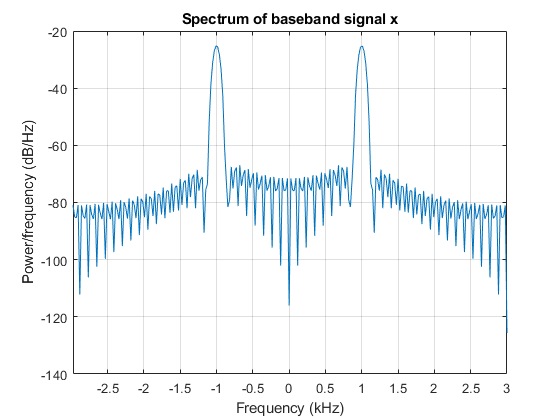 The filter designs meet the passband and stopband frequency specifications that you set using the Bandwidth, StopbandFrequencySource, and StopbandFrequency properties. Number of sections of CIC decimator, specified as a positive integer scalar. Order of CIC compensation filter stage, specified as a positive integer scalar. Order of third filter stage, specified as an even positive integer scalar. When you set the DecimationFactor property to a 1-by-2 vector, the object ignores the ThirdFilterOrder property because the third filter stage is bypassed. Two-sided bandwidth of input signal in Hz, specified as a positive integer scalar. The object sets the passband frequency of the cascade of filters to one-half of the value that you specify in the Bandwidth property. Set the value of this property to less than SampleRate/DecimationFactor. Specify the source of the stopband frequency as one of Auto | Property. When you set this property to Auto, the object places the cutoff frequency of the cascade filter response at approximately Fc = SampleRate/M/2 Hz, where M is the total decimation factor that you specify in the DecimationFactor property. The object computes the stopband frequency as Fstop = Fc + TW/2. TW is the transition bandwidth of the cascade response computed as 2×(Fc–Fp), and the passband frequency, Fp, equals Bandwidth/2. 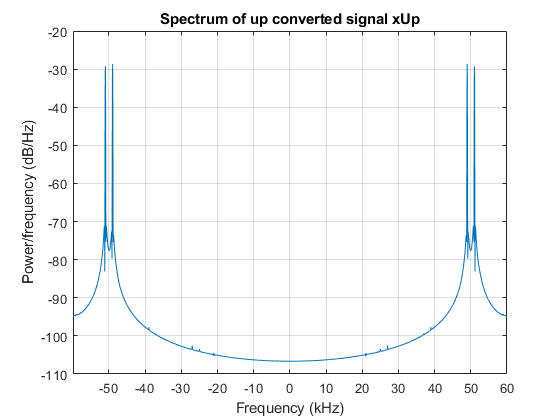 Stopband frequency in Hz, specified as a positive scalar. Passband ripple of cascade response in dB, specified as a positive scalar. When you set the MinimumOrderDesign property to true, the object designs the filters so that the cascade response meets the passband ripple that you specify in the PassbandRipple property. Stopband attenuation of cascade response in dB, specified as a positive scalar. When you set the MinimumOrderDesign property to true, the object designs the filters so that the cascade response meets the stopband attenuation that you specify in the StopbandAttenuation property. Specify the oscillator as one of Sine wave | NCO | Input port | None. When you set this property to Sine wave, the object frequency down converts the input signal using a complex exponential obtained from samples of a sinusoidal trigonometric function. When you set this property to NCO, the object performs frequency down conversion with a complex exponential obtained using a numerically controlled oscillator (NCO). When you set this property to Input port, the object performs frequency down conversion using the complex signal that you set as an input to the step method. When you set this property to None, the mixer stage in the object is not present and the object acts as three stage cascaded decimator. Center frequency of input signal in Hz, specified as a positive scalar that is less than or equal to half the value of the SampleRate property. The object down converts the input signal from the passband center frequency you specify in the CenterFrequency property, to 0 Hz. This property applies when you set the Oscillator property to Sine wave or NCO. Number of NCO accumulator bits, specified as a positive integer in the range [1 128]. Number of NCO quantized accumulator bits, specified as an integer scalar in the range [1 128]. The value you specify in this property must be less than the value you specify in the NumAccumulatorBits property. When you set this property to true, a number of dither bits specified in the NumDitherBits property will be used to apply dither to the NCO signal. Specify this property as an integer scalar smaller than the number of accumulator bits that you specify in the NumAccumulatorBits property. Specify the data type at the input of the first, second, and third (if it has not been bypassed) filter stages as one of Same as input | Custom. The object casts the data at the input of each filter stage according to the value you set in this property. Specify the filters input fixed-point type as a scaled numerictype object with a Signedness of Auto. This property applies when you set the FiltersInputDataType property to Custom. Specify the data type of output as Same as input | Custom. 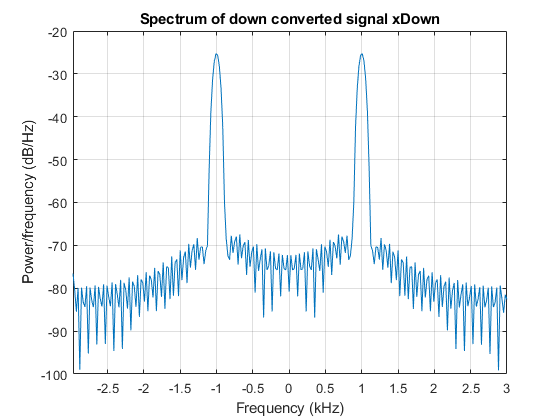 y = dwnConv(x) takes an input x and outputs a signal, y that is frequency downconverted and downsampled. y = dwnConv(x,z) uses the complex input, z, as the oscillator signal used to frequency down convert input x when you set the Oscillator property to Input port. Data input, specified as a column vector or a matrix. The length of input x must be a multiple of the decimation factor. When the data type of x is double or single precision, the data type of y is the same as that of x. When the data type of x is of a fixed-point type, the data type of y is defined by the OutputDataType property. The input can have multiple channels only if its data type is double or single. The input can be of data type double, single, signed integer, or signed fixed-point (fi objects). Oscillator signal used to frequency down convert the input signal, specified as a column vector or a matrix. This input must be complex. The length of z must be equal to the length of x. z can be double, single, signed integer, or signed fixed-point (fi objects). This input applies when you set the Oscillator property to Input port. Down converted and down sampled signal, returned as a column vector or a matrix. The length of y is equal to the length of x divided by the DecimationFactor. When the data type of x is double or single precision, the data type of y is the same as that of x. When the data type of x is of a fixed point type, the data type of y is defined by the OutputDataType property. Create a digital up converter object that up samples a 1 KHz sinusoidal signal by a factor of 20 and up converts it to 50 KHz. Create a digital down converter object that down converts the signal to 0 Hz and down samples it by a factor of 20. Create a DigitalUpConverter object. Use minimum order filter designs and set passband ripple to 0.2 dB and the stopband attenuation to 55 dB. Set the double sided signal bandwidth to 2 KHz. Create a DigitalDownConverter object. Use minimum order filter designs and set the passband ripple to 0.2 dB and the stopband attenuation to 55 dB. Create a spectrum estimator to visualize the signal spectrum before up converting, after up converting, and after down converting. 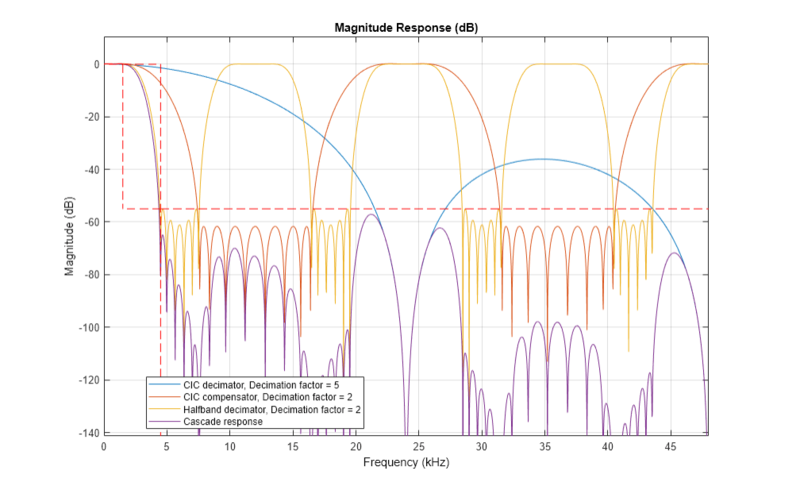 Get decimation factors of each filter stage of the dsp.DigitalDownConverter System object™. Create a dsp.DigitalDownConverter System object with the default settings. Using the getDecimationFactors function, obtain the decimation factors of each stage of the object. The DecimationFactor property of the object is set to 100. The output M is by default a 1-by-3 vector, where each element in the vector is a factor of the overall decimation factor. When you set the DecimationFactor to a 1-by-2 vector, the object bypasses the third filter stage and sets the decimation factor of the first and second filtering stages to the values in the first and second vector elements respectively. The output of the getDecimationFactors function is now a 1-by-2 vector. The object downconverts the input signal by multiplying it with a complex exponential with center frequency equal to the value in the CenterFrequency property. The object downsamples the frequency downconverted signal using a cascade of three decimation filters. In this case, the filter cascade consists of a CIC decimator, a CIC compensator, and a third FIR decimation stage. The following block diagram shows the architecture of the digital down converter. The scaling section normalizes the CIC gain and the oscillator power. It may also contain a correction factor to achieve the desired ripple specification. When you set the Oscillator property to InputPort, the normalization factor does not include the oscillator power factor. Depending on the setting of the DecimationFactor property, you may be able to bypass the third filter stage. When the input data type is double or single, the object implements an N-section CIC decimation filter as an FIR filter with a response that corresponds to a cascade of N boxcar filters. A true CIC filter with actual comb and integrator sections is implemented when the input data is of a fixed-point type. The CIC filter is emulated with an FIR filter so that you can run simulations with floating-point data. The following block diagram represents the DDC arithmetic with single or double-precision, floating-point inputs. The following block diagram represents the DDC arithmetic with signed fixed-point inputs. The input of each filter is cast to the data type specified in the FiltersInputDataType and CustomFiltersInputDataType properties. The oscillator output is cast to a word length equal to the input word length plus one. The fraction length is equal to the input word length minus one. The scaling at the output of the CIC decimator consists of coarse- and fine-gain adjustments. The coarse gain is achieved using the reinterpretcast function on the CIC decimator output. The fine gain is achieved using full-precision multiplication.